With conditional formatting, you can use rules to automatically highlight charts, tables, and number widgets in your dashboard. In this step, you save a view of your dashboard with conditional formatting applied. 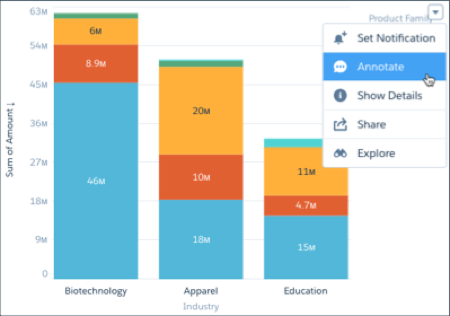 Then you annotate the saved view, and share your data insights with others in your org. Highlight high and low values based on ranges and colors that you specify. You’re going to add a rule to the table widget that makes it easy to see numbers above and below a threshold. Click the Opportunity Name table widget to select it, and then click Column in the Properties panel on the right. 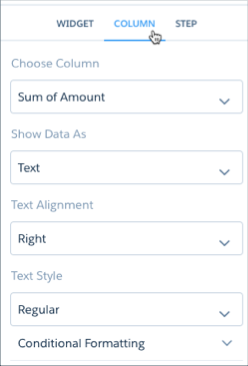 If you don’t see the Column properties tab, click away, and then click the table again. In the < Specify range field, enter 5000000, and then select Red under text color. In the ≥ Specify range field, enter 5000000, and then select Green under text color. Click the Save icon, and then click Save. Now, set dashboard filters and save your view of the dashboard. Only you can see your views—other users still see the original dashboard. You can create multiple views and choose one as the default that shows when you open the dashboard. You can also share the URL to your saved view so that when users open the link, they see your view of the dashboard. Preview the dashboard by clicking the Eye icon . From the Industry list widget, select Apparel, Biotechnology, and Education. At the top, under the My Amazing Dashboard tab, click Modified, and select Save View. For the View Name, enter My Amazing View, and then click Create. 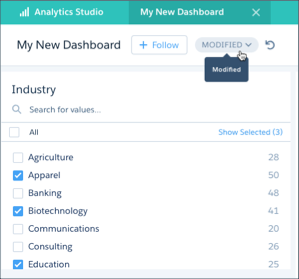 Analytics assets can be shared across users, groups, or roles. To enable others to see a lens, dashboard, or dataset, share the app it’s in. You can grant Viewer, Editor, or Manager access to apps that you manage. After you grant access to the project manager in your org (Laura Garza), she can see the amazing data you share with her. Click the Analytics Studio tab. Click the Apps tab, locate the app you created, and click the name. Click the Give Access tab. Under Invite others, select User, and then enter Laura Garza. Click Viewer and select Editor, and then click Add. Post Chatter comments directly on the dashboard using the annotation feature. With annotations, you can hold conversations about your data and how it’s visualized, with the dashboard right there for reference. Hover in the upper-right corner of your Stacked Bar chart, click the dropdown menu, and then select Annotate. 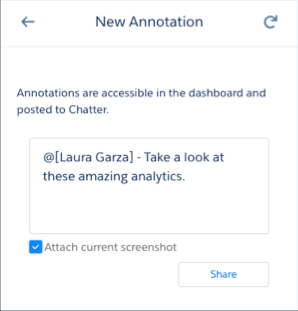 In the New Annotation box, enter @Laura Garza, and then add a note for Laura. Click Attach current screenshot, and then click Share. Congratulations! You now have first-hand experience creating data visualizations and building Analytics dashboards and apps. 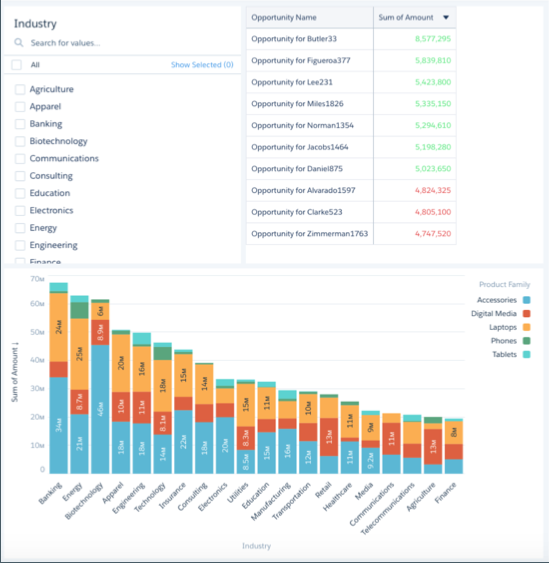 You’re on your way to becoming an Einstein Analytics expert! Before you click the green button, make sure that your Analytics-enabled Developer Edition org (not the Playground) is selected in the picklist next to the Launch button.